Russia and China are outpacing the United States in the development of super-fast missile technology, Pentagon officials and key lawmakers are warning. They are leaving us in the dust on this weaponry and it is a severe threat to national security. Hypersonic missiles fly into space after launch, but then come down and fly at high speeds on a flight path similar to an airplane. Their lower trajectory makes them more difficult for U.S. missile defense satellites and radars to detect. Russia has openly stated it is developing high-speed air-launched missiles as well as underwater hypersonic drones. “Right now, we’re helpless,” Sen. James Inhofe (R-OK), a senior member of the Senate Armed Services Committee, said in advocating for more investment in hypersonics, along with missile defense. Unfortunately, the Air Force just delayed our hypersonic bidding contract once again. Lockheed Martin (LMT), Northrop Grumman (NOC), Boeing (BA), Raytheon (RTN), or Orbital ATK, which is being bought by Northrop, are in the running for a contract to build a hypersonic strike weapon that could be launched from fighters and bombers. The contract initially was supposed to be awarded sometime in federal fiscal Q1, which began in October and ended in December. In December, the Air Force said the contract would be awarded in federal fiscal Q2, which ends on Saturday. Now the Air Force is looking at an award in early spring, said spokeswoman Maj. Emily Grabowski. 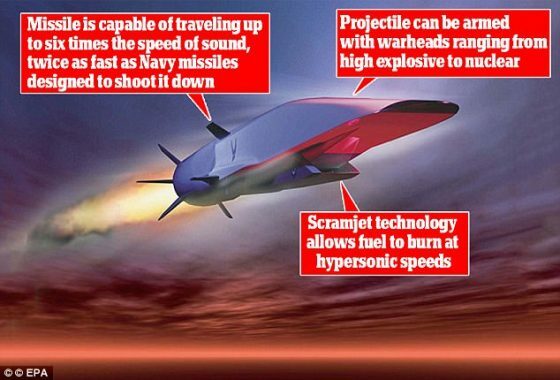 Hypersonic weapons travel at five times the speed of sound and have the potential to be the most disruptive battlefield technology since the advent of stealth. While intercontinental ballistic missiles are faster, hypersonic weapons’ combination of speed, range, maneuverability and ability to take unpredictable flight paths make them extremely difficult, if not impossible, to shoot down with today’s technology. Last November, China conducted two tests of a ballistic missile with a hypersonic glide vehicle that U.S. assessments expect to reach initial operating capability around 2020. They have already conducted at least seven tests of experimental systems from 2014 to 2016. And I would not be surprised if the weaponry wasn’t operational far sooner than estimated. Russian President Vladimir Putin delivered a flashy state of the nation address this month to show off a bunch of new weapons, including a hypersonic missile he claimed was “invincible” against U.S. missile defenses. About a week later, Russia claimed it successfully tested a hypersonic weapon. The intercontinental hypersonic missile, dubbed Avangard, is capable of reaching targets at 20 times the speed of sound and will strike “like a fireball,” Putin said. At the time of Putin’s announcement, the Pentagon said it was “not surprised” by the report and assured the public that it is “fully prepared” to respond to such a threat. But just last week in front of Congress, Hyten conceded U.S. missile defense cannot stop hypersonics. He said that the U.S. is instead relying on nuclear deterrence, or the threat of a retaliatory U.S. strike, as its defense against such missiles. That goes beyond foolish right into suicidal. “We don’t have any defense that could deny the employment of such a weapon against us, so our response would be our deterrent force, which would be the triad and the nuclear capabilities that we have to respond to such a threat,” Hyten told the Senate Armed Services Committee. Karako pointed out that the last five administrations have all identified space-based sensors as a critical need on paper, but nothing has come to fruition on it. “One of the reasons that we haven’t prioritized the hypersonic threat is we were slow to kind of appreciate not merely the Russia and China problem, but the Russia and China missile problem,” Karako said. And why is that? We’ve all known for a long time that Russia and China are our two top military threats. We also know they have been racing to develop military weaponry, especially high-tech weaponry. So, why haven’t our military tacticians figured out the hypersonic missile threat posed by these two communist regimes? In a word, Barack Obama. The Trump administration is reversing some of this, but we are far, far behind. The National Defense Strategy and the Nuclear Posture Review focus on a “great power competition” with Russia and China. Sen. Deb Fischer (R-NE), chairwoman of the Senate Armed Services Strategic Forces Subcommittee, likewise cited them as helping the U.S. get back on track in the area of hypersonics. “I think we are aware of the capabilities that our adversaries have, and … whether it’s the Nuclear Posture Review, National Defense Strategy, these are all laid out because of the identification of the threats we have,” she said. In addition to the nuclear review, Pentagon officials have been touting budget proposals that would put more money toward hypersonics and missile defense that they say will help close the gap with Russia and China. Hyten told the Senate Armed Services Committee that there’s $42 million in the fiscal year 2019 budget for the Air Force and the Missile Defense Agency to work on a prototype for space-based sensors. Air Force Secretary Heather Wilson, meanwhile, told the House Armed Services Committee last week her fiscal 2019 budget includes $258 million for hypersonics. Defense Advanced Research Projects Agency (DARPA) Director Steven Walker touted his $256.7 million fiscal 2019 budget for hypersonic missile development as well. Inhofe said he’s most worried about the missile defense issue, adding there “appears to be no defense” against hypersonics. To him, the answer is reversing defense budget cuts, which Congress has taken steps to do in a two-year budget deal and a recently passed appropriations bill for fiscal 2018. “We need to make up the losses that we had during the Obama administration by putting a priority, which we are doing now, on the military,” he said. Let’s just hope we catch up in time before our enemies use hypersonic weapons against the U.S.
Rev. 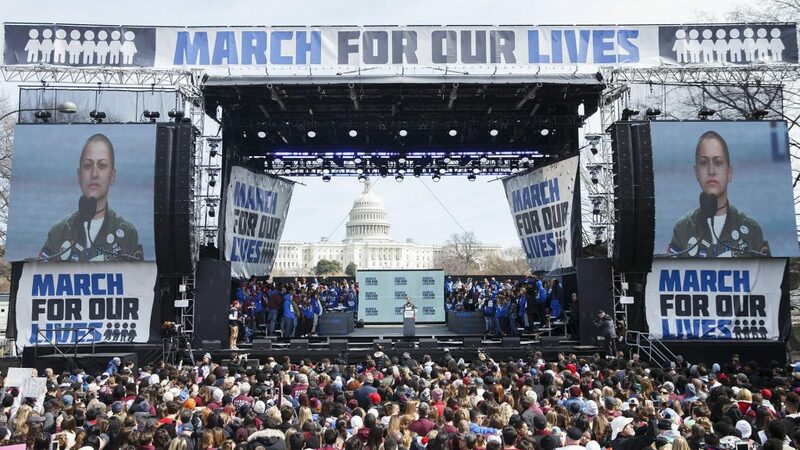 Al Shapton’s half-brother Kenneth Glasgow of Dothan, AL, was charged in a murder Sunday after his group participated in the anti-gun March For Our Lives rally Saturday. The Rev. Al Sharpton is in the news again and this time it’s not for being a radical racial agitator and Marxist. His half-brother, Rev. Kenneth Glasgow, who is also an activist, had just finished marching in the anti-gun “March For Our Lives” rally when he was arrested and charged in a shooting death in Dothan, Alabama. According to police, Glasgow was the driver in a car that is linked to the murder of 23 year-old Breunia Jennings of Dothan by passenger Jamie Townes, 26. Dothan Police Chief Steve Parrish said that Glasgow and Townes allegedly searched for Jennings, who they believe had stolen Townes’ car. When they found her, Townes allegedly shot Jennings as she drove, hitting her in the head. She died some time later. “Instead of him notifying law enforcement, he took matters in his own hands and jumped in Mr. Glasgow’s vehicle to find Breunia Jennings,” said Parrish, according to a report in the Dothan Eagle. Police do not believe that Glasgow, 52, pulled the trigger. But under Alabama’s complicity statute – their aiding and abetting law – he is culpable for the murder. Dothan is about 110 miles south of Montgomery, AL. Authorities said several people are believed to have been in the car at the time and additional arrests may occur. 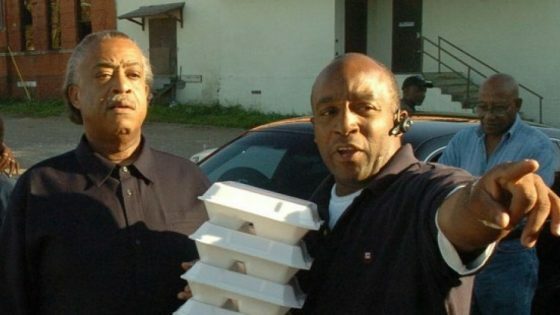 Sharpton and Glasgow have been activists on numerous projects together. Glasgow is an ex-convict. He started a ministry in Alabama called The Ordinary People Society. 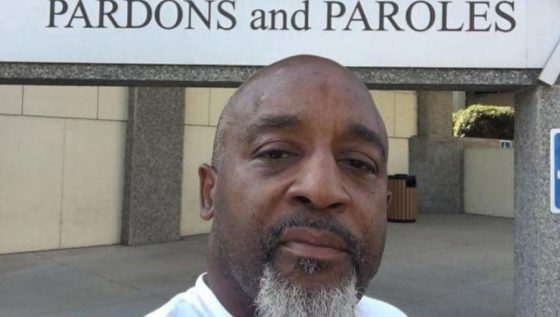 He has been campaigning for restoring the voting rights of convicts, something that Van Jones is promoting as well. His group participated in the Saturday anti-gun march in Dothan. “The shooting occurred late Sunday night. I do not know where he was prior to the incident. It has been reported by several local outlets that he attended a similar event on Saturday,” said a police spokesman. In an appearance in court, Glasgow repeatedly questioned the capital murder charge against him, The Dothan Eagle reported. “I don’t know why I am facing capital murder charges,” Glasgow stated. “I’m not responsible for what someone else does. He just asked me for a ride to take him to look for his car.” He was advised to not speak until his attorney is present and that he is not eligible for bail due to the seriousness of the crime. Glsgow is set to appear again in court on April 6th, when a judge will determine if there is enough evidence to send the charge to a grand jury for possible indictment. The Rev. 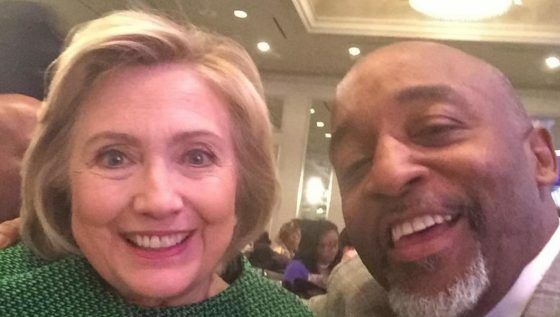 Al Sharpton is known for corruption and race-baiting. He also wholeheartedly supports communists and thugs. It looks like it runs in the family. Glasgow is about to find out that ignorance of the law is not a defense in the state of Alabama. 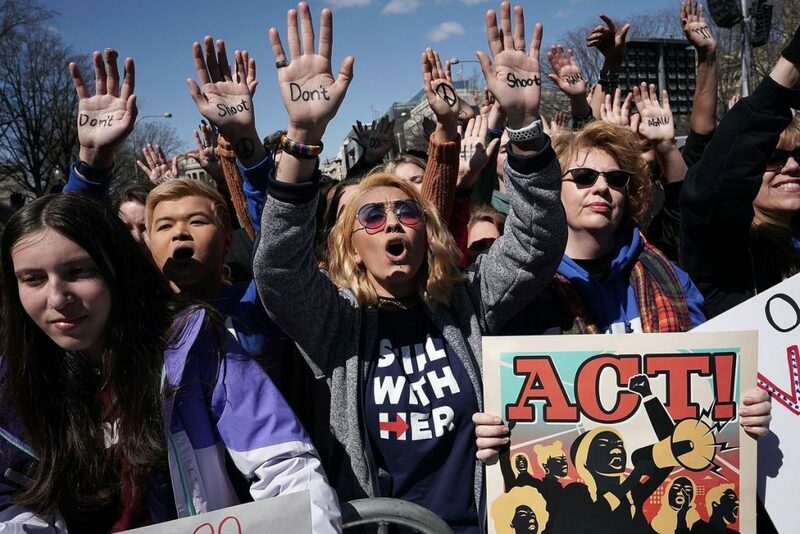 “Grassroots” March for Our Lives Rally featured Demi Lovato, Miley Cyrus, Jennifer Hudson and Ariana Grande, among others. In the early 1970’s, Assata Shakur (born Joanne D. Chesimard) was a member of the Black Liberation Army (BLA), a Marxist Black separatist group who murdered 16 police officers across America over the course of a decade. New Jersey state troopers Werner Foerster and James Harper pulled over a white Pontiac on the New Jersey Turnpike in East Brunswick for a broken tail light on May 2, 1973. The officers were met with Marxist Black Liberation Army (BLA) members Joanne D. Chesimard (Assata Shakur), Clark Squire (Sundiata Acoli), and James F. Costan (Zayd Malik Shakur). After a shoot-out, BLA thug James F. Costan and Trooper Foerster were dead and Trooper Harper was gravely injured. At the time of Chesimard’s arrest for the murder of New Jersey State Trooper Werner Foerster in 1973, She was “also under indictment for bank robberies in the Bronx and Queens and for a hand‐grenade attack on a police car,” as reported at the New York Times. Chesimard was also wanted at the time for questioning in the murder of Patrolmen Rocco Laurie and Gregory Foster in the East Village on Jan. 27, 1972. 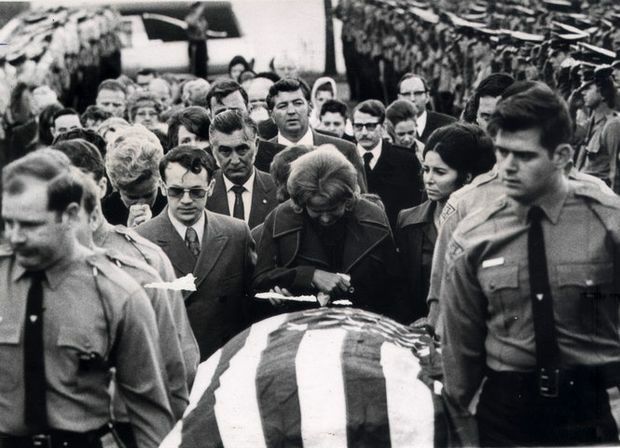 Troopers carry the body of Werner Foerster during his 1973 funeral. Assata Shakur, step-aunt of slain communist rapper Tupac Shakur, escaped from prison in 1979 and fled to Cuba, where she lives today. There is a 2 million dollar reward for her capture. But Shakur, much like terrorist killer Rasmea Odeh, is a hero to the radical left. It is likely that the rally attendees do not know, or know and don’t care, that they are chanting for their own tyranny. Egypt is holding its presidential election now through March 28. President Abdul Fatah Al-Sisi is running for re-election after four years of his first term. There is one opposing candidate from the Tomorrow Party who has vowed to cast his vote for the president and encourages all Egyptians to do the same. The ballots will be counted by the Election Commission as usual with the political parties in observance. The president is an independent candidate of the military without a political party. However, the military will be absent from the process because constitutionally it cannot be a part of civilian elections. With the outcome already determined, Egyptians view the election as a comedic performance mainly because it is too painful to take seriously. Any real opposition candidates to the president have been orchestrated out of the process by the Al-Sisi government in the past months. (See my article entitled: Egypt: Al-Sisi’s pre-election maneuvers guarantee his March victory). State-sponsored media rave about the popularity of Al-Sisi and show pictures of Egyptians endorsing him with his campaign slogan of “build it.” But certain facts belie such reports. For instance, the media is pressuring the electorate to go out and vote by stressing it as the sacred duty of every citizen. Guilt infliction would not be necessary if a highly popular, reformist incumbent were running. Christian clergy and Muslim Imams are threatening the populace with the fate of hell for those who do not go to the voting polls while the courts threaten non-voters with monetary fines. State employees are told by their managers that they will receive punishments for misconduct if they are absent from the performance of their electoral duty. Meanwhile, Orthodox churches in the Egyptian diaspora around the world are arranging buses to haul church-goers to offices of the Egyptian Consulate to cast their vote for Al-Sisi. This follows the directive of Pope Tawadros II, an advocate of the president, when last week he announced plainly that, “It is the obligation and duty of every person to vote.” Low turn-out at the polls would bring embarrassment to the president and must be avoided at all cost. Complacency is being combated by the state, church and mosque, but the anger boiling underneath the surface of the ersatz conformity is an even bigger threat to Al-Sisi and can’t be dealt with as easily by the regime whose appearance must remain “democratic.” Calling the election a farce, the Civil Democratic Movement has risen up to boycott it. Analysts are citing it as the object of the president’s anger and the reason for the regime’s pressure upon voters across the country. Anger in general toward Al-Sisi’s failed record is what led the regime in the first place to eliminate risk by clearing the ballot of opposition. 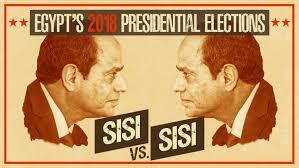 The other candidates presumably represented forces so insidious to the country and the welfare of the citizenry that Al-Sisi waited until they threatened his position as president to deal with their lurking presence. Moreover, his failure to float ideas to fix the country’s infrastructure problems, inflation and poverty has been accompanied by a rise in police state tactics such as “aurora” visits to contrarians and jail for speaking freely and critically. Considering this in the light of the president’s promises of democratic reforms and talk of human rights, Egyptians are left with cognitive dissonance. Orthodox Copts have solved this problem by accepting Al-Sisi as a ruler who “means well” in light of terror atrocities, brute police force, rigged courts and rubble in place of churches. Political relativism helps this along. Are the Copts correct in agreeing with Al-Sisi that any other option rising in the political arena would be much too risky and threatening to Egypt’s long history of military rule? Military rule is all Egyptians know. Another military man as president would be pointless and, if less endearing, might prove disruptive to the stability of a people who need to manage daily life under massive corruption and civil decay.